I am so glad that this week is going by quickly. I am desperate for the weekend right now. I want to cuddle with my husband in bed on Saturday morning while the sun streams through the window. The chill of the autumn air making us pull the covers around our chins. The smell of coffee brewing downstairs. The peaceful look on our dogs face as she catches the last few minutes of sleep. Without a doubt, this is my favorite time of the week. I look forward to it each Saturday morning, and it changes slightly throughout the year depending on the weather outside. I think I’ve been craving these times increasingly more because of the beginning of the school year. With David coming home and working until 11 PM on school work, we don’t have as much time together as I’d prefer. It makes me long for the weekends. While I wait for Saturday, however, I have plenty to do. I have a house which desperately needs cleaning. It astounds me how the house can be clean one night and a disaster the next night (and we don’t even have children yet)! I also have laundry which needs to be done, and I am kicking myself for not making my own laundry detergent yet because the store detergent is expensive. Today, I have an appointment with my ENT at University of Chicago as well. I’ve been having bad sinus headaches, bloody noses, and swollen lymph nodes in my neck/shoulders, so I think it’s time that I am seen. I’m not looking forward to the drive, but hopefully I can find some relief from the pressure. So, it’s a busy time until the weekend, but it will all be worth it the moment that I wake up with my sweetheart next to me and knowing we have nothing to do for a few hours. Best. Feeling. Ever. Thank you so much, Laurie. I’m pretty sure I have chronic sinus infections, so it’s more of a waiting game for me to get over it. 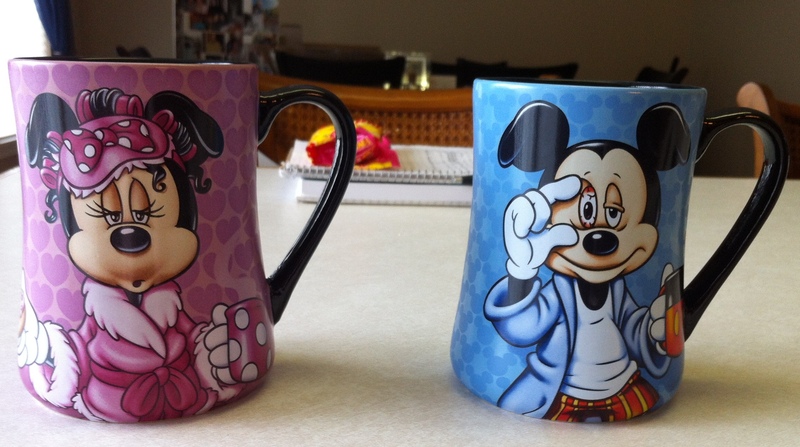 The mugs were purchased in Disney, and they are our favorites. They are huge as well so they require fewer trips to the coffee pot. I should post about the laundry detergent actually, but it’s extremely easy. I use Dove bar soap (99% natural), borax, and Arm & Hammer soap. The ratio is one bar of soap, one cup borax, and one cup A&H. Couldn’t be easier. The grating of the bar soap takes a little bit of time, but I feel much better using fewer chemicals in my laundry.